Where is GST shown on my bill? Do I use My Account or Member Services? For information on tax refund eligibility please consult your registered tax advisor. Want to switch paper billing off/on? Head to My Account. To view and print a bill, log in to My Account. To view and print a tax invoice or bill, log in to Member Services and follow the steps shown via the button below. Follow the steps above to download and save the bill to your computer. 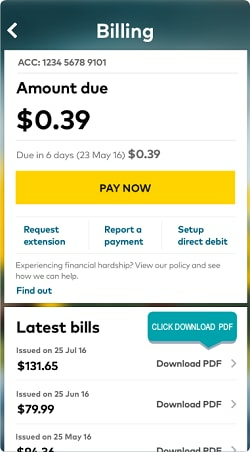 Need to view or print an older bill? To view and download a tax invoice or bill, follow the steps shown via the button below. Is the bill for a service, that's eligible for online billing? This depends on the type of services you have. For assistance with online billing, eligibility and functions, check out this article.